Root canal treatment or endodontic therapy is mistakenly viewed as a painful procedure. This form of dental therapy is performed to remove the infection from deep within the tooth. The procedure is a pain-relieving treatment and has the capacity to prevent reinfection. It is normally carried out to prevent tooth decay or cracked tooth, which necessitates further treatment. Undergoing the therapy is a surefire way to counteract pain and the potential to develop an abscess. In the majority of cases, the procedure is performed without any complications. Although patients may feel some pain during the recovery period, the discomfort is generally mild and not as severe as some people expect. However, there is a need to select an experienced dentist who knows how to treat them. Any traces of bacteria left behind after the therapy can lead to the recurrence of sharp pain. If pain returns following a root canal treatment, the patient will require follow-up treatment to remove the remaining traces of bacteria. The dentist should detect any additional canals because the treatment will not succeed if any are missed. The remaining canals can hide bacteria, thus prolonging the infection. The follow-up treatment for a missed canal can be cumbersome because fillings, implants, and crowns must be removed before proceeding. Additionally, a good dentist uses high-quality materials to ensure durability. The inner seal can deteriorate, thus enabling bacteria to flourish and infect the root. During therapy, the dentist carefully removes infected pulp before cleaning and shaping the patient’s tooth from the inside. The practitioner proceeds to fill and seal the canal to protect against infection. 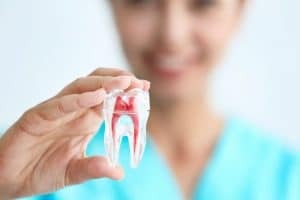 When the procedure is complete, the dentist will request the patient to return for fitting the crown, which is designed to provide maximum protection. The crown makes it easier to chew after the root canals treatment. When done correctly, the procedure restores normal function and eliminates pain. Back to Basics: Back-to-SchoolWhat Are CEREC Single Visit Crowns?